The internal frame is comprised of Luon plywood configured in a reverse "L" shape. The bottom of this frame will hold the Eden motherboard and connect to the bottom of the computer's case. 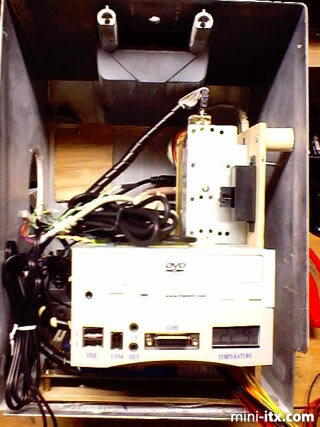 The vertical part will hold the 4 port USB hub, 2.5" HDD, DVD drive and front transfer panel. 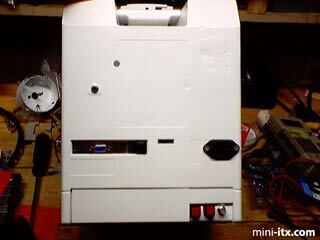 On the front, you can see the DVD drive, transfer panel, CF slot (above the 7" LCD) and the case sticker backlight. The Apple symbol has been remounted to a super-bright LED (power LED) and gapped at 2mm. 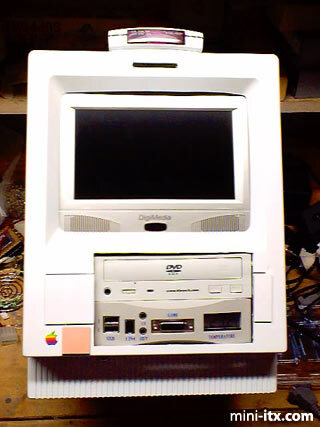 The effect is a bright blue glow outlining the apple symbol when the unit is powered on. There is also a blue ElWire mounted inside the base of the case. When powered on, this gives a slight blue glow which also adds to the overall Wraith theme. At the very top of the case, you can see the receiver for the IR keyboard. I originally wanted to mount this inside the case, but I ran into several problems with that plan. The first of all was space. The PCB is larger than it looks and would not fit neatly anywhere. The other major factor was angle. The only space I could have mounted the receiver was under the lip of the case at the bottom front. This would block a good deal of the IR rang of the receiver. I also decided not to replace the red LEDs with blue ones, at least not the super-bright type since my kids will be staring at the screen just below the LEDs. I may replace them with standard ones later (maybe on refit #2). The Micro-ATX PSU came with a variable fan controlled by a thermal sensor in the power supply. I replaced this fan with the YS-Tech fan. 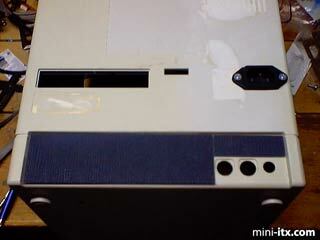 By reusing the front brightness control knob, the fan's speed can be adjusted from the front of the case. 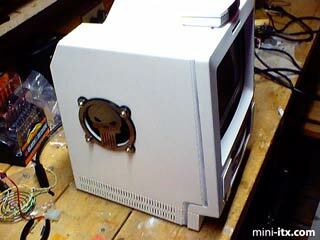 The power supply is mounted to the fan and the fan is connected to the case via the Punisher fan cover. Here you see the rear power button and reset button (unlabeled for now), the RG-6 cable bulkhead (for the 7" cable TV) and a switch to select the internal (LCD TV speakers) or the external connection on the front transfer panel.